After a nice few days in Dalat, it was time to continue north. We hopped on a 3 hour bus to Nha Trang, which turned out to be the worst ride we've had so far this trip. The driver careened around twisty mountain roads at 50 mph, with a bus full of crying babies and vomiting adults. And just when we thought we were roughing it, the bus pulled over for a pit stop...in a field full of low brush. Ladies, have you ever tried toileting daintily in a field full of short grass next to a very tall bus full of men? It's a challenge, to say the least! We arrived finally in Nha Trang, a town we thought we would use for a one night stop over to ease the annoyance of our travel days. What we found was a surprising delight of a town! 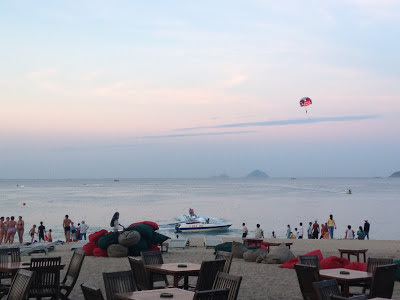 Nha Trang is more developed than the beaches we visited in Thailand (as evidenced by the Sheraton and Best Western hotels right on the beach front road), but the beach itself is long, wide and beautiful. We stayed in a little hotel (the quiet and delightful Truong Giang Hotel) about 5 blocks from the beach, in the backpacker area, which turned out to be a great way to get cheap food and drink during our visit. The touristy nature of Nha Trang has helped us solidify our understanding of Vietnamese sales tactics for foreigners. The script goes something like this: "hello, where are you from?" To not be rude, you respond. Then you realize all the sudden that you're in a conversation and you can't get out, even though you never wanted to buy (insert tour, clothes, restaurant here)!!! I discovered a good response tactic, which is to say "no thank you!" firmly but with a smile, and slow enough so that they can't get a word in, but you're already passed them by the time you finish declining. Works like a charm! We spent a couple of afternoons drinking beers on the beach, watching parasailers over the bay, and despite my intense fear of heights, we thought, "gee, that looks like fun!" So we thought we'd try it out (thanks for the sponsoring, Mama B!). Basically, you go up to a guy on a beach, pay him $40, skip any formalities like waivers, and then he straps you into a harness. You tell him it's too loose and insist it be tightened. When you're all set, a boat on the other end of the rope takes off and you go flying into the air, hovering between the bay below and a colorful parachute above. You scream in terror while your husband behind whoops and hollers like he's having fun. Then you see the most beautiful sunset and stop screaming because it's just so pretty. And you realize you're having fun! And then the boat turns, the wind shifts, and the parachute is no longer holding you up. Huh. You go gracefully plummeting to the water, where the boat continues to speed along as you, your husband, and your various legs smack along the top of the water painfully. After what seems like an eternity (but is probably no longer than 5 seconds), the wind shifts again and you are in the air, your body held up by the biggest wedgie imaginable (ouch!). Then the ride is over, you flutter back down and plop into the water, bobbing around. All the sudden, a jet ski comes racing to save you. Actually, he just wants to parachute back so he can send more tourists into the air. You can swim back to shore yourself. All in all, quite an experience! Sailing Club: Expensive, but really lovely beach front bar and restaurant. 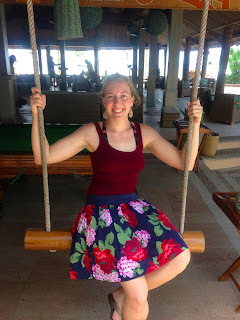 Their happy hour deal is a plastic bucket full of Tiger beers, they have a nice pool table, and there are swings all over the restaurant (although if you think you can actually swing on them, you would be mistaken. Stern looks abound if you're caught...). 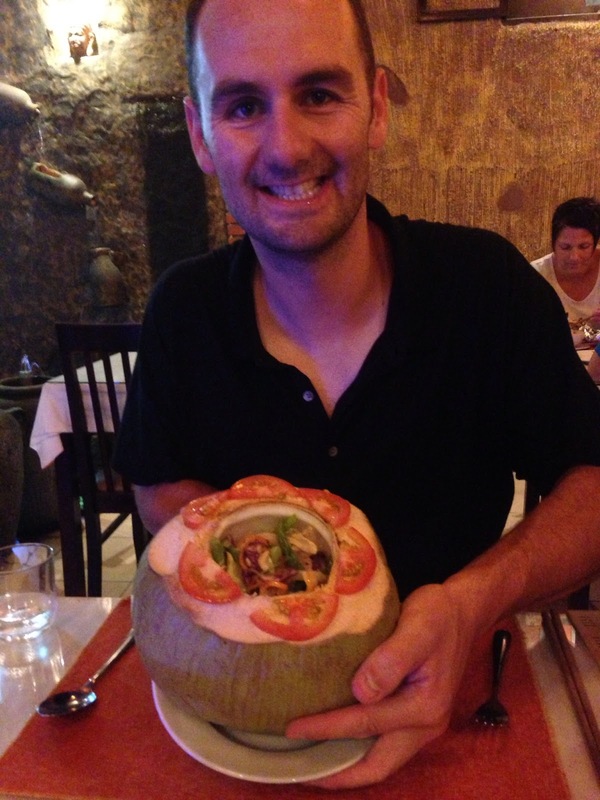 Lanterns Restaurant: One of the best dinners we've had in a while, and certainly the best in Nha Trang! A gorgeous restaurant (with lanterns of course), fabulous (and insanely cheap) food, and excellent service.